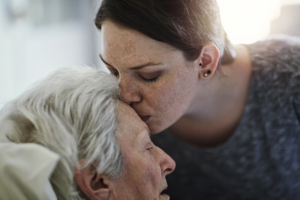 Unsurprisingly, families want to do all they can to fulfill their loved ones’ needs, but dementia caregiving can result in an extremely high level of both mental and physical stress. This takes a toll on the caretakers’ own overall health over the years, particularly as the disease progresses. And a lot of family members believe there’s an all-or-nothing approach: either manage the senior’s needs in the home, or face moving him or her into nursing care. • Highly skilled care. Because our caregivers are both trained and experienced about the many intricate facets of Alzheimer’s disease along with other forms of dementia, they can proactively handle and more effectively manage even the most challenging of behaviors, such as wandering, aggression, sundowning, and many more. • Enhanced safety. The potential risk of accidents is increased for everyone with dementia. Even something that appears as uncomplicated as assisting your loved one into the shower or onto the toilet can add a dangerous fall risk. Professional caregivers know exactly how to watch out for and avoid falls, keeping both you and your loved one safe from personal injury. • Sustainable aging in place. Very often, family caretakers become so overwhelmed wanting to meet every one of a senior loved one’s needs in tandem with their own that a change to a residential dementia care facility seems unavoidable. However, working with an expert dementia caregiver opens up the possibility of long-term, effective care at home. • Peace of mind. Knowing your senior loved one is in capable hands enables you to take a deep breath, relax, and step away from the stresses of caregiving for the necessary breaks that alleviate stress and the potential for caregiver burnout and depression. It is a good idea to explore in-home dementia care options as early in the disease as possible to allow for a more seamless transition and also to be sure that your family member has the most beneficial care from the start. Reach out to us by contacting us online or calling our care team at 954-486-6440 to ask about a consultation from the comfort of home, where we can establish a highly individualized plan of care that will improve wellbeing for your senior loved one today, and also as needs change in the days to come.